Mosaic‘s food cart is a new vendor at the South of the James market this season, but Mosaic has been one of Richmond’s best catering companies since 1997. Over the past 16 years, Mosaic has won dozens of awards from Richmond Magazine, Style Weekly, Virginia Living Magazine, as well as national sources. They’re small menu includes biscuits and gravy, plus my personal favorite, shrimp and grits, plus other specials cooked fresh on-site by Chef Ian. Share, like, or comment on this post on the GrowRVA Facebook page, and you’ll be entered to win a free meal from the MOSAIC food cart at the South of the James Winter Market. A winner will be randomly selected and announced via Facebook at 8pm. I started working with MOSAIC a few years ago and last April we decided to enter the food truck arena. We decided that this fell under our “Express” division that I run so it became something I started managing! Our food truck is just one of the divisions of MOSAIC– we offer a range of services including rentals & lighting, event coordination and full service catering for events like weddings, fundraisers and business meetings. MOSAIC catering can be seen all around town– we coordinate events such as the AHA Heart Ball every year, we’re the exclusive caterers at places around town like the Redskins training camp and we have huge corporate catering business that coordinates food for some of the top companies around town everyday! We love SuperFresh and their grilled cheese sandwiches! We love to do breakfast food like homemade biscuits & gravy and shrimp & grits– we think it’s nice to give customers the option of a hot, hearty breakfast while shopping. 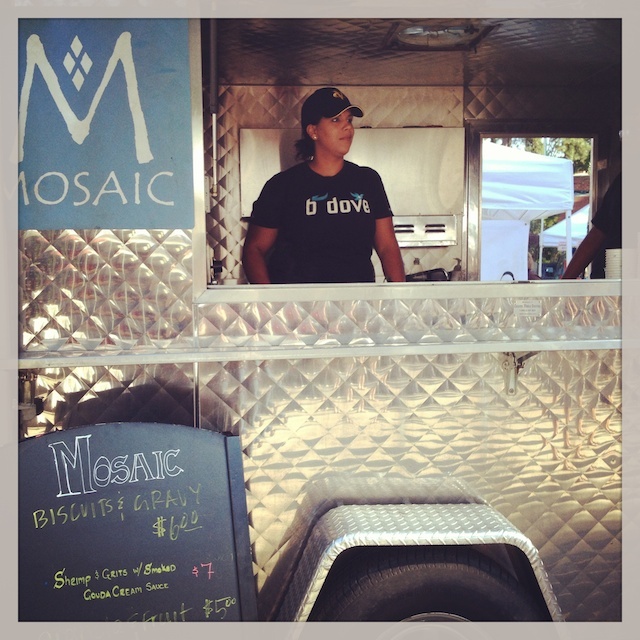 I love Mosaic and didn’t know they now have a food cart! This is awesome!